Turns out there are lots of bad things going on throughout Drunkeros but luckily Queen Aludra has called her allies to defend Deephome. Listen as we play out a huge battle and repel thousands of enemies from the entrance of the dwarven home land of Deephome. Gasp as a mighty brontosaurus covered in goblins smashes the ranks of a dragonborn cavalry. Stare in awe at a dragons approach over the horizon! The adventure continues with Skud Derringer (Mike Bachmann), Rowan Grey(Jennifer Cheek), ... Maggiori informazioni Lahnik "Lahni" Caplain (Nika Howard), Toby Treacletart (Tim Lanning) and your Dungeon Master (Michael DiMauro). Don’t forget to follow our regular editor David Stewart (@spudcam), and also our junior editor Alan Mathews (@JAlanMathewsJr)! Podcast art by @cclaray! Want the world to see your fan art? 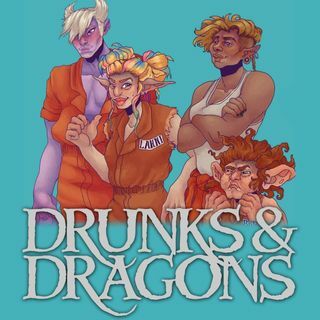 Tweet it with #DrunksAndDoodles or head on over to the forum.